Your brain is an amazing contraption. You can let it destroy your life, or you can cultivate it with God’s thoughts, and it can help you to become someone wonderful. Left on its own, your mind will destroy you. We MUST take control of our thoughts. Step outside of your mind and watch it work: For example...your mind will convince you of all the reasons to compromise. And then, after you have, it will condemn you and accuse you and tell you to quit. Your mind will teach you to hate, and then condemn you for hating. Your mind will incite you to seek pleasure or adventure and then torture you and rip you to bloody shreds as soon as you have. Your mind, left to do whatever it pleases, is a dictatorship, a tyranny of pain and contradiction. Step outside of your mind and watch it try to control your moods and your decisions! That little animal in there that tries to destroy you is amazing. It’s NOT YOU—it just wants to CONTROL and DESTROY you. “The mind CONTROLLED by the SPIRIT is LIFE and is PEACE.” “CHRIST in you, the hope of Glory!” Cry to Jesus for the “renewing of your minds”—everything depends on it! 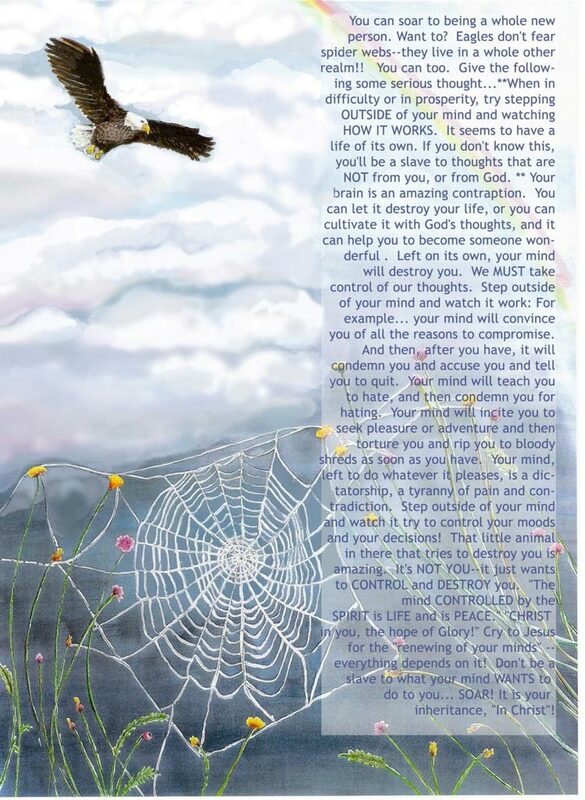 Don't be a slave to what your mind WANTS to do to you...SOAR! It is your inheritance, “In Christ”!